It was done on the Gnashional Health Service. Some parts of Mr Jagger were hard to swallow. "Impressive aren't I. You should try flossing with webbed feet"
"Don't worry he wont bite you...he's too long in the tooth"
"I bet you prefer Arm and Hammer?" Bill Gates' twin sister, Pearly. "Missing backpackers, you say? No, I know nothing about that." Just another day in the British Dental Association. Jeezuz! 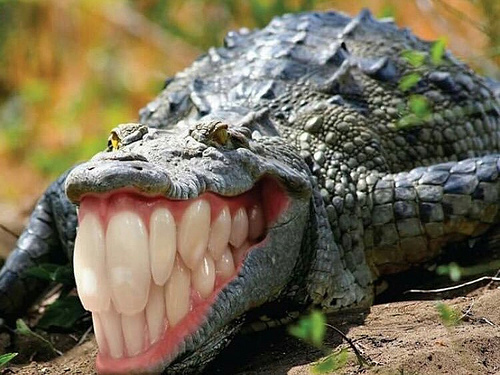 So that's why you should never smile at a crocodile. When the sun shines, you can see Ali a mile off. "Hath amybuddy see my teef? I dink I loth dem a de Evagwades." Meanwhile, old man Johnson's new teeth were scaring the crap out of everyone in the rest home. The horse faced freshwater crocodile was always a sore point with Darwin. Phew! It turned out to be a false alarm. When the Croc and the Joker teamed up, it was never going to end well. "Don' worry, they'd hardly denture." Now there's alternative. A Croc wearing a Dentist. "I shouldn't have eaten that Rylan Clark-Neal." "My teeth? I bought them from Amazon."